The first time I came back from New Caledonia, in 2007, I showed my friend Peter a map of the country and he said, ‘It looks like it could be a great place to cycle in.’ Peter is crazy about cycling, has cycle-toured in many countries. When I returned to Caledonia ten years later, he customised a bike specially for my needs: tough enough to handle rough roads, good on tarmac too, and able to carry four paniers with full camping kit. In due course I saw how it works: mountain bikes strapped on the back of a four-by-four speeding down the highway to a car park from which you can do a day’s circuit on dirt roads. That wasn’t what I had in mind. You don’t need a tent for that. And my whole purpose in coming here, as a novelist researching a book whose story concept had come like a bolt out of the blue during my previous visit, was to travel around the country, using the bicycle – and tent – as a means of engaging more porously with people and place than had been possible the last time, when I had a hire car. On the offshore island of Lifou, cycling was fine. It’s not a big place and, though the roads are quite straight and fast, people overtook courteously, I didn’t feel in danger, and I even saw a few local men – middle-aged ones like me – using a bike as if it really were the natural mode of transport in that scale of landscape. Back on Grande Terre, the mainland, I had to put my bike in the hold of a bus to get out of Nouméa and far enough north that the main road was no longer a motorway. It was still extremely fast, though. It was built for speed – straight and broad. Cars didn’t pass very often but when they did they hurtled past at well over 100 miles an hour, especially on the west coast. The east coast road has windier bends but there too the cars will go fast when they can. Only once did I see another cyclist and that was in a town. Everyone who found out I had a bicycle was keen to tell me the story of a cyclist a couple of years back who’d been doing the circuit of Grand Terre and been killed by a drunk driver. Though there are plenty of unmade roads that branch into the countryside to the tribes and farms, most of them are dead ends, they don’t make a network, and always you have to come back to the main road that follows the coast. It seemed a shame, and not just from the point of view of cycle-touring. Here was a small country, with a small population, abundant natural and cultural wealth, fabulous landscape, and an absolutely unique ecology. An opportunity, you might imagine, to develop in bold new ways, in tune with the environment; but, so far as roads are concerned, the impulse is to make things as fast and modern as possible, to provide the most rapid access from the rural north to the capital city in the south. But I was just a visitor, of course. It’s up to the people of a place to decide how they want to be. And in fact I had a great time. The bicycle and tent and the dirt roads did enable me to see something of the country’s interior, and, most importantly, to meet people, especially Kanak people in the tribes, in a way I never would have done with a car. It was an excuse to stop overnight, to talk, to offer the customary gift and be invited to look around. What I saw inland was a life quite different from the life of the big road, a life that seems still in tune with the environment, that turns on the seasonal cycles of small-scale crops and the intimacy of community. The hospitality I received was humbling, the conversations often profound, for all the limitations of the schoolboy French I’d been polishing up the preceding year. So my trip was not the flop I feared it might be that first day at the tourist office. In fact, it exceeded all my hopes in terms of meeting people and learning about their lives. I didn’t spend quite as much of my time in Caledonia on two wheels as I expected. That’s thanks largely to the extraordinarily generous hospitality I received in Nouméa also, and the many interesting people I talked to there, who gave other perspectives upon the life of this country from those I encountered in the bush. Let me finish this piece by being honest. If you’re looking for a country to go cycle-touring in, I wouldn’t really recommend New Caledonia as ideal, but it’s a fabulous country, blessed in so many ways – and, for my particular purposes, a push bike, a tent, and the new friends that I made really proved to be the key to the kingdom. If you’re planning a vacation to the South Pacific gem of New Caledonia, you won’t be disappointed. If anything, it will exceed your expectations. Many people who have visited New Caledonia feel this way and are excited to return. Most importantly if you’re traveling with kids, you’re in for a holiday that’s not only about all-inclusive luxurious accommodations, but absolutely fascinating islands to explore, and a chance to revel in the world’s most beautiful – and largest – coral lagoon. You’ll also get the chance to get to know a different culture, and a different way of life; so it wouldn’t hurt to acquaint yourselves with this informative New Caledonia etiquette guide beforehand. Anyway, without further ado, here are some ideas for where to go to or to take your kids for additional holiday fun. No matter how long your stay is, be sure to check them out, in addition to other well-known attractions. Ile aux Canards is a very family-friendly excursion location and a favorite tourist spot. It’s okay to sometimes stay away from conventional and crowded sightseeing places and enjoy your own DIY excursion, but some are truly worth a visit. Especially if they’re classified as a UNESCO World Heritage site. It’s a snorkeling paradise that will make you feel like you’ve entered the set of “Finding Nemo”, or at least your kids will. If you’re located in Nouméa, this island is only 5-minute boat ride away from Anse Vata beach. Do encourage your kids to have a dive and enjoy a mesmerizing sight of corals and many other sea creatures, like multi-colored fish, sea turtles and more. Another breathtaking New Caledonia experience is whale watching. Be sure not to miss it if you’re planning your trip from July to September. If you ever get tired of snorkeling and lying around on the sandy beaches (as if you would), or a more likely scenario, if the weather is a bit colder, or simply because your kids would enjoy bonding with animals (especially if they like horses), then this might be the perfect option for you. Horse clubs in New Caledonia have courses for all ages and levels. You can visit Thio and the Koné villages or Yala Ranch in Dumbéa, which is not that far from Nouméa. Your little ones can enjoy a few circles on a pony, or if you’re up for a bit of adventure, organized tours over the river and to the mountain range, ending with camping in the mountains might be your cup of tea. Why wouldn’t you want to play golf surrounded by splendid forests, and crystal clear seas? Hey, why not in New Caledonia? It might not be the first thing that comes to mind, but since there are so many beautiful golden terrains available, why not check the nearest New Caledonia golf clubs and sign up for a course that’s friendly for your kids and your budget? Your kids can play separately, in kids’ groups, or you can all play together, whether you’re beginners, or if you want to teach them. 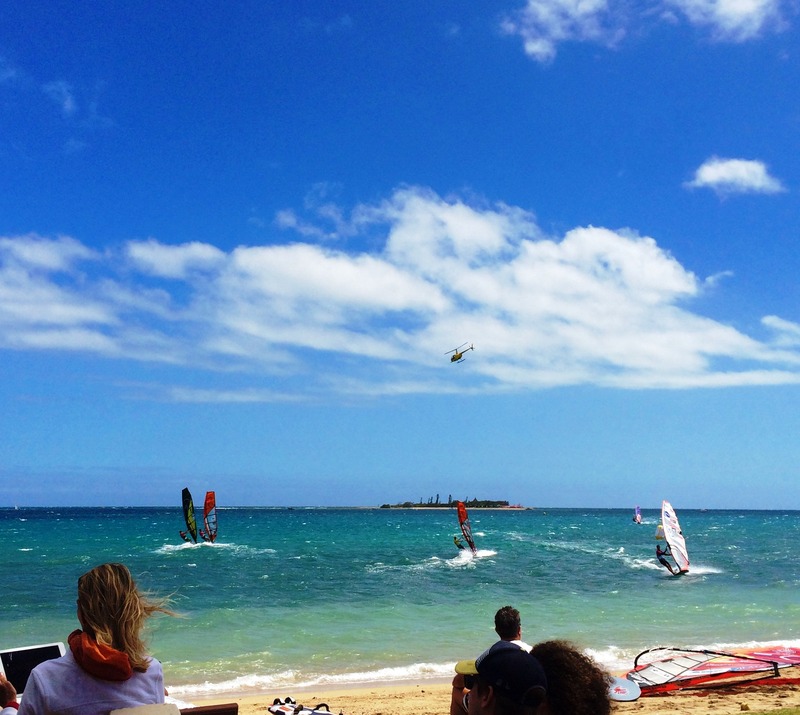 New Caledonia is a wind/kite surfing mecca for windsurfers. It’s a big step to enroll in this activity for anyone who isn’t professional, even with all the surfing schools and courses. But kite surfing on one of the open shores can be a great way to spend your day. It’s a simple pleasure that will grow quickly on any kid, plus it’s very affordable and available practically everywhere. You can sit back and take a few scenic photos of your kids kite-surifing as a memory. You already have the perfect background. Marie Nieves is a student and a blogger who loves unusual trips, gadgets and creative ideas. On her travels she likes to read poetry and prose and to surf the Internet. Her favourite writer is Tracy Chevalier; she always carries one of her books in her bag. You can find Marie on Facebook or follow her on Twitter and Pinterest. Our time here is winding down and I find myself stopped in my tracks. It isn’t enough to say I have loved it here or that I will miss it. Words such as these seem but easy, empty, to mutter while smiling, as our friends start to stay goodbye. Of course I have loved it in New Caledonia – and with this second stay of 3 years, I have come to love it even more. And I have hated some of it, too. With this last time here, I’ve seen a bit more of New Caledonia’s underbelly – bloated and putrid and needing a good clean. But it has made me love it no less. Regular readers know I have grappled with the lack of efficiency, with the lack of a true vision, with the slowness of progression on this island. But having traveled to other islands this year (Vanuatu and French Polynesia), I can tell you that New Caledonia is developed, modern, and developing at a rapid rate, in comparison. I do wish it would consider its future in more than just depletion of its natural resources. I do wish it would see the true value of its indigent cultures, its pristine waters, its towering forests, its many endemic species, its talented youth and wise women – and thus its potential for true sustainability. I do hope it will never let itself be bought or raped or poisoned – that it helps us keep our foothold in good, clean living. I do hope New Caledonia will find a way to peacefully resolve its disagreements over independence – that it will find a way to respect this nation’s people – the Kanaks, the Caldoches and the Metros. That this nation’s peoples will find a way to respect one another, work through their racism, work through their fear, and work through and change this country’s deepening inequality. Work must be done to lower the cost of living and to spread the wealth. Barring such work, I am afraid New Caledonia will see even greater educational and social disparities, greater crime and even greater fear. All of this can be avoided, but an inclusive, far-and-wide-reaching vision is needed. Yes, I will miss New Caledonia. 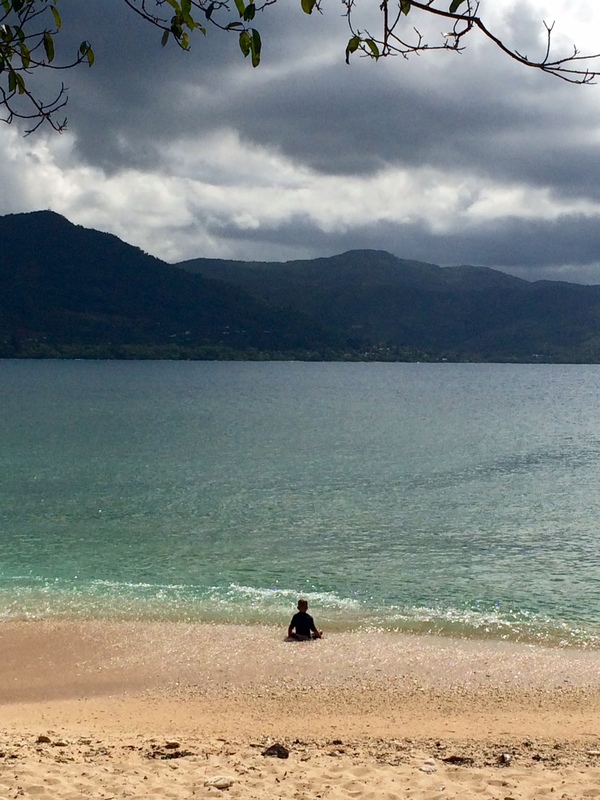 Some days I ask myself what I will miss more: New Caledonia or the life it afforded me. New Caledonia has provided us with such an amazing life. If you’re here, you know how beautiful it is, especially as you get up north or off to its islands. If you’re not here, all you have to do is look at these photos. Having traveled a fair bit in recent years, I do think New Caledonia is still an unexplored and under-appreciated island. Its waters are clear, its coral are healthy, it is home to sea turtles, dugongs, tropical fish, sharks, dolphins and passing whales. Its “terre rouge” is just stunning. It is quiet. It is calm. And it is still healthy. The life I’ve had here has been one of “no stress“. With views like these from my “office” (see below), with walks along the promenade, with dips in a warm, clean ocean, I’ve been able to think, to be and to create. Clown fish have kissed my snorkeling mask and brought me among life’s greatest happinesses. I have swum for hours, yes hours over the last 3 years, with sea turtles nearly my size. I have spent that time you lose track of underwater, just being, surrounded by tropical fish and marine life. I have known what it is like to slow down so much you feel the slowing of your pulse and the utter peace of mind that is always waiting for you to get there. New Caledonia has served as a base from which we could jump, explore, grow bigger and more open, and return. Without our lives here, we would not have known such adventures, here and in other parts of the Pacific. It has been an entryway, a passage, into both a peaceful and exciting life. In the end, it is the little things that are the big things, though. It’s the ice cream guy at the Baie des Citrons, it’s the smiling faces who know you by name in the post office, the shops. It’s the judo classes and the windsurfing lessons and the art classes and the walks by the bay. It’s the biggest shrimp you’ll ever see and the no tomatoes or onions for 3 months. It’s the tabloid newspaper and the island radio stations, the twinkling lights at nightfall and the scary drive to the airport. It’s the regular workouts with your friends and the coffees and the lunches at Ptit Café. It’s that turtle who just happens to be there and that day at Ilot Maitre. 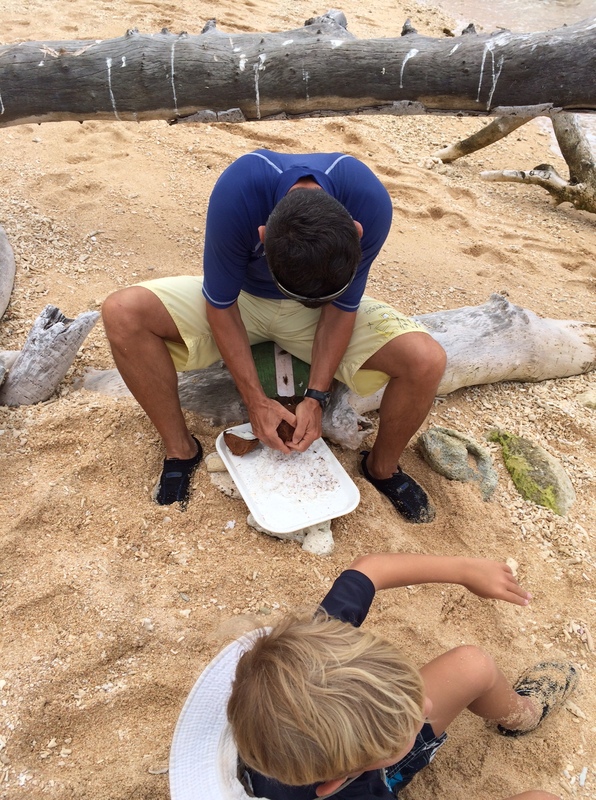 It’s those trips to Ile des Pins that are forever etched in your brain, in your heart, with Nouka and his family. It’s the “Tata bisous”, and the thought that we’ll always be here, doing what we’re doing, now and for always, no matter what. Tata bisous, ma belle. I love you and will miss you. What the heck happened? 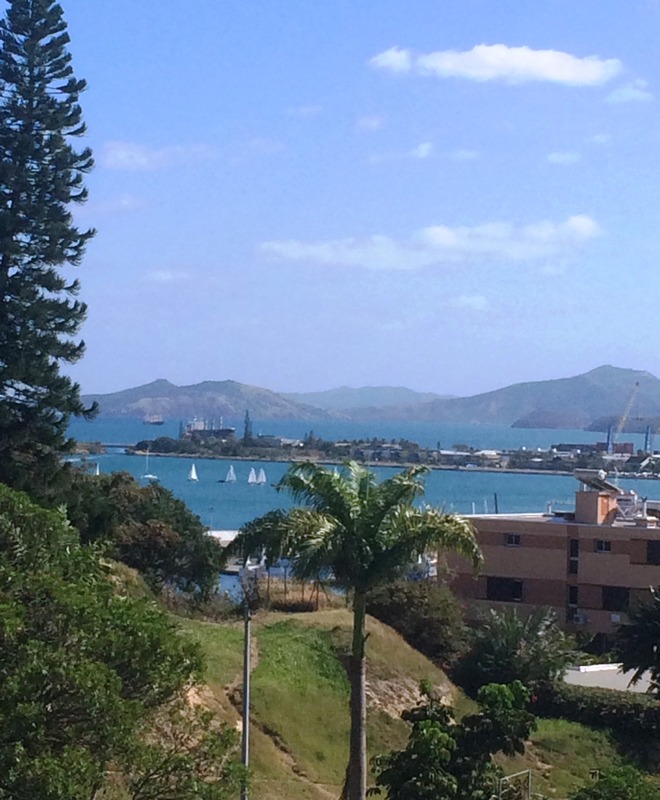 Several among you have sent me messages to know if I am still in New Caledonia. Where did I go? Why did I stop writing? The truth is, 2015 hit us with a wallop. In mid-January I found myself in the emergency room and then a few days in the hospital with every battery of heart and brain test you can imagine. If anyone wants to know what medical care is like – or my experience of it – in New Caledonia, shoot me a note and I’ll think about blogging about it. Yes, New Caledonia has trained medical staff and all the modern equipment (if perhaps in limited quantities). Yes, hygiene is good. Yes, the food is bad (but isn’t all hospital food bad?). Yes, it’s horrible waiting around all day in a hospital bed. But again, I think it’s the same everywhere. Would I want to spend a lot of time in the hospitals/clinics here? No. But then I wouldn’t want to do that anywhere. 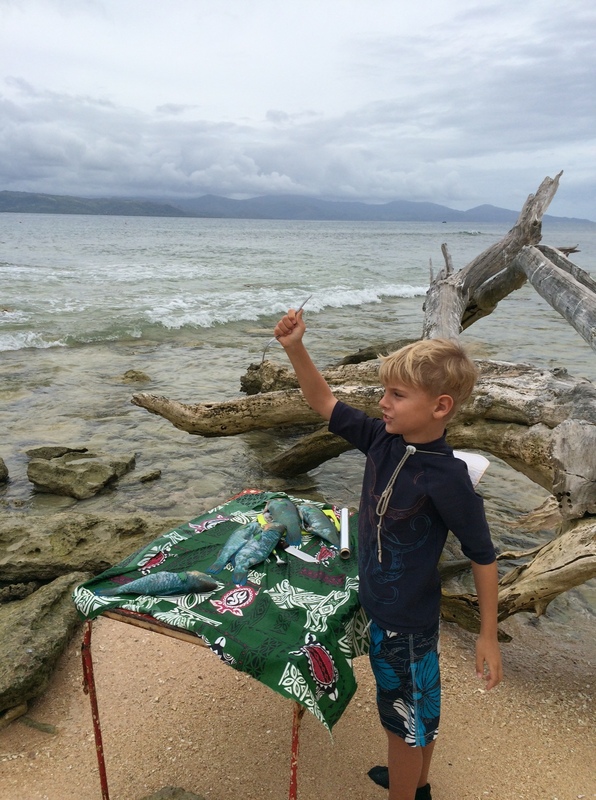 February saw a world school trip to Vanuatu which was out of this world – and just ahead of Cyclone Pam. We were extremely lucky to see and taste and smell the beauty Vanuatu has to offer before it experienced such destruction. We met and spent many an hour with the locals on several islands (Efate, Malekula, Santo, Tanna) – and our minds and hearts will be forever etched with their kindnesses, with their pure happiness with next to nothing. March and April have seen full-on work and school for Pablo and I, without a break. We’ve learned that we are moving to the south of France for August of this year. And so starts the return move machine. 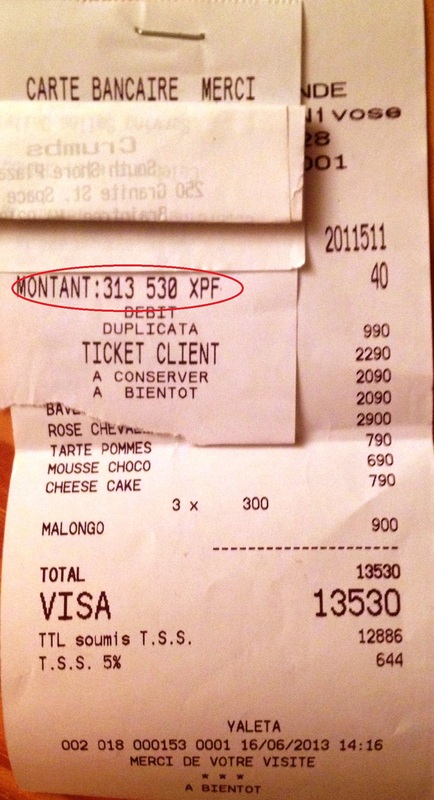 We’ve purchased our around-the-world return tickets (they feel like around-the-world, but as we’re not returning to New Caledonia, they aren’t really), started sorting our things to sell and to give, have met with movers, talked with the quarantine about moving our pet and are facing the inevitable end of our stay here. 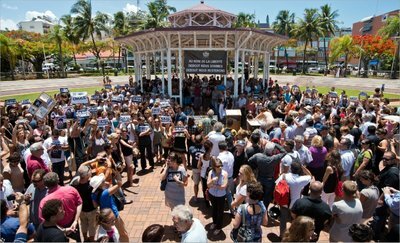 What has been happening in New Caledonia? Independence is very much in the news. Groups are meeting and marching to demonstrate against independence. Note the flyer at the top of this post, left on our car yesterday. 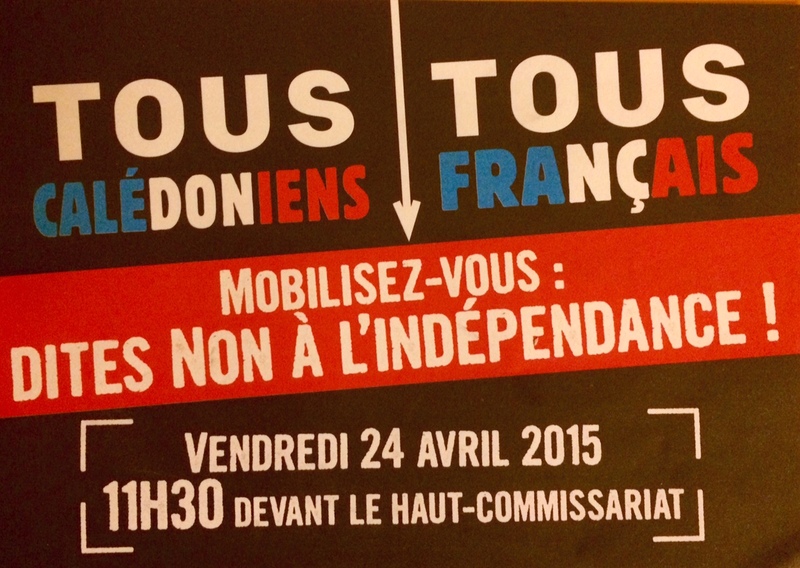 It’s a tricky issue, as described here: French elections reverberate in New Caledonia. Nouméa just hosted the Oceania Judo Championships. 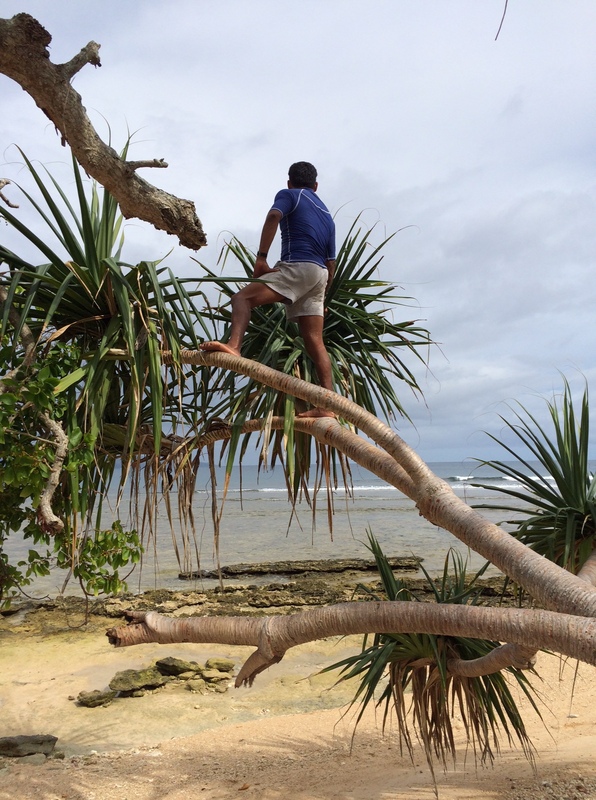 We just missed Cyclone Pam – or rather, she missed us, having clobbered Vanuatu. One of the people we met travelling in Vanuatu won the 2015 New Caledonia Poker Open Main Event. 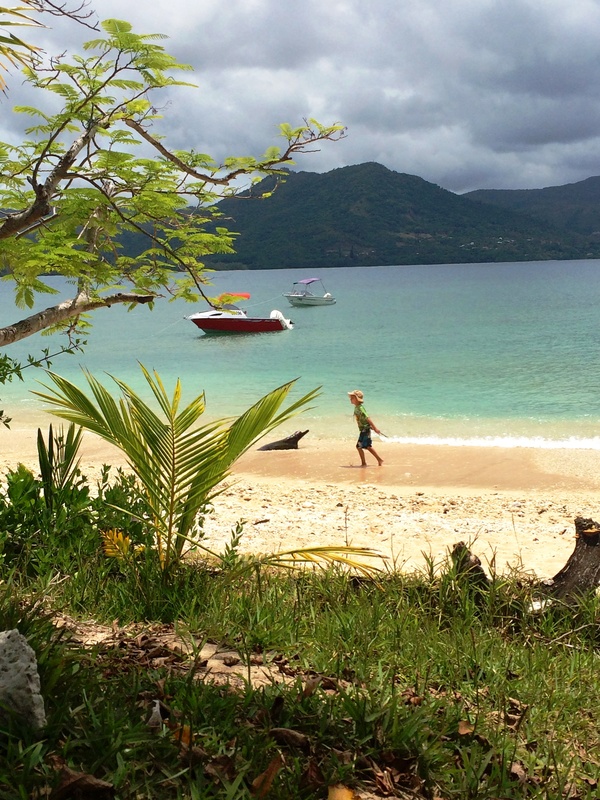 The Telegraph asks New Caledonia: France’s most idyllic spot? And of course we still have the car accidents and the road deaths, the random fights and the stolen vehicles. We have the high cost of living and problems with the nickel plants, the polluted beaches and the political disputes. 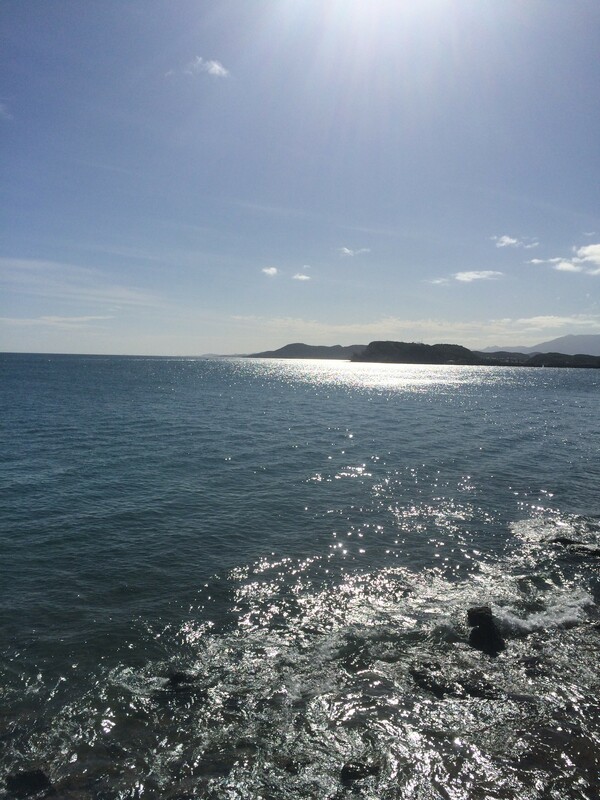 On the bright side, we have leopard shark love in central Nouméa (see below), the most beautiful weather you can imagine, stunning views, a pristine lagoon, clean air and a high quality of life. We are free of much of the crime we see on TV in the United States and Europe, we live simply, unconsumed by consumerism, we live with the sun and spend much of our lives outside. Would you live here, if you could (and you don’t)? I guarantee you would miss it, having had it for a few weeks, months or years. I’ll do what I can to keep writing before we leave. If there are any topics you’d like to know more about before this chapter closes, shout, and I’ll see what I can do to accommodate you. Knowing you’re there keeps me thinking about all the best things there are to share about life in New Caledonia. With the horrifying events this last week in France, New Caledonia has stood in solidarity with France. Within hours of the news on Thursday morning our time, 1,000 people met at the Place des Cocotiers to express their shock, pain, disbelief and solidarity with the victims, and with France. 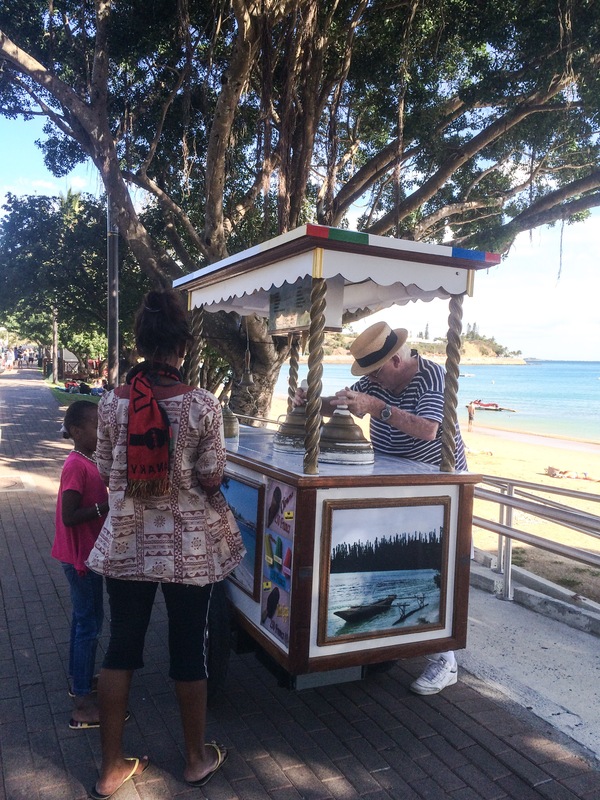 Others gathered throughout the day throughout New Caledonia. It is very hard for those of us who have friends and family in Paris and France as we text, Skype and email our support, our love and our encouragements back 22,000 kilometres – and harder still for those in France. Facebook and Twitter feeds document living with sirens, terror in unexpected alarms, deep sadness during moments of silence, anger at such dramatic and sudden loss, a complete defense of freedom of expression. At least 1 million people are expected to march in Paris today in solidarity against this week’s terrorist attacks in the city. New Caledonia will be with them, among but many around the world. 1 million will march. How many millions will be there in heart, mind and spirit? Looking for a bit of the “back of beyond”, marooned on a desert island, with only a knife, matches and a little salt and pepper to get you by? Have we got the adventure for you! A few weeks ago, we ventured back up to Poindimié for a long weekend. It’d been a while since we’d been up north, and we missed it – the crashing waves at night (and the niggling feeling, “Will we be swallowed up whole in our slumber?”), the fresh air, the friendly people, the break from everyday life. With the aim of doing some geocaching and discovering the Poindimié area a little more, off we flew on our next island adventure. Casting about for something to do on our first full-day visit, our hotel (Hotel Tieti) advised against visiting the waterfalls (nearly all dried up due to a drought), but suggested a walking adventure or a tribal visit. We opted for a bit of both with Alain, of Brousse O’thentik. Though we had visited the Oua Tom tribe 18 months before, this visit was as instructive, if not more so. Unfortunately, we were unable to meet the chief (and faire la coutume – offer our gifts, show respect and ask for permission to visit his lands), but Alain spent all morning with us explaining many of the Melanesian traditions and customs (and showed us the lands anyway (leaving the gifts with the chief the next day), ending with a lesson on making bougna and properly throwing a fishing net). In the north, the tribes live very simply. Ernest (the chief), had for example, only just purchased a kitchen stove (as you can see in the photo). 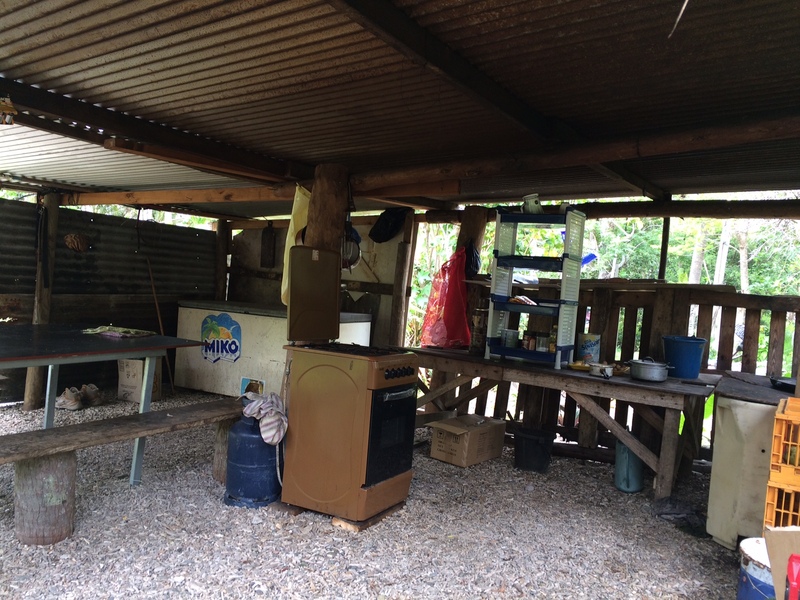 Retired, he and his family had lived for years with an outdoor fire to cook their food. No electricity, no warm water, no running toilet, no washing machine (and he is considered prosperous, as he is a chief and owns quite a bit of land, which he cultivates with bananas, root vegetables, coconuts, etc. ), a visit puts our lives into perspective. No books, no toys, one mattress, one hut where the four family members sleep, a hose for a shower, no refrigerator, no car, but organic food (he uses natural, rather than chemical, pesticides), access to fresh fish and a strong community. We were very impressed to learn more of Kanak law during our visit. The Kanaks have their rules and punishments in addition to the French law, and to my mind, they are much stricter. Alain gave us an example. Recently some youth stole the pastor’s 2 pigs. 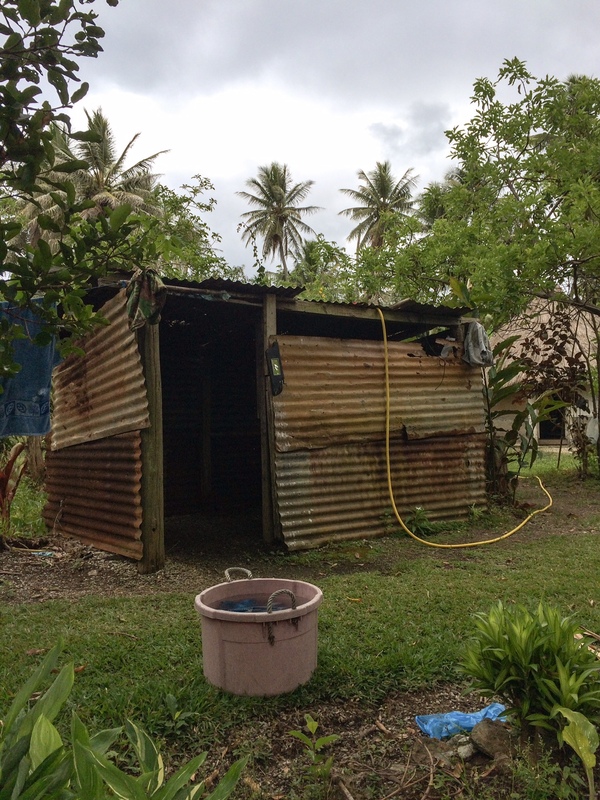 According to Kanak tradition, the pastor is a highly respected member of the community. Any harm to him or his property is gravely punished – the only more highly respected member of the community is the chief. Just after the 2 pigs were stolen, the 200 members of the tribe were summoned by the chief: he pressed them to identify the guilty parties (or to come forward). Eventually, 2 young men came forward. They were publicly beaten within an inch of their lives. Alain tells us they were right to come forward early, for it they had not, if they had ever been found out, they would have been banished from the tribe. To regain their place in the tribe, they would have had to replace the pigs, repay the pastor via work or other ways, request forgiveness of the pastor and the chief and the community, and make an offering to each member of the tribe. Alain explained that rather than face banishment, youth (and adults) go away to work to be able to repay their debts and rejoin the tribe – as being ostracized results in much harder lives (homeless, without work, no support, hungry, etc.). Having learned so much with Alain, we decided to spend another day with him the next day. Brousse O’thentik provides cultural visits in the north in an “a la carte” fashion. 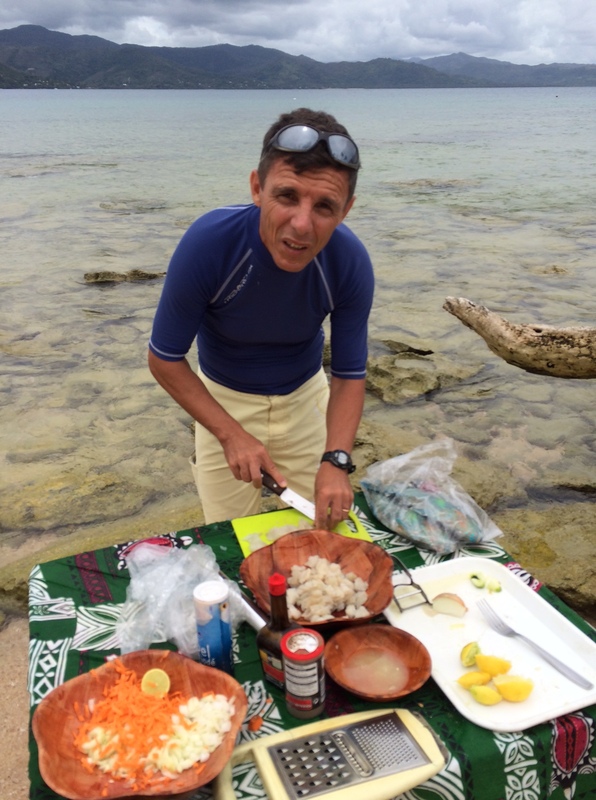 If you want to go biking and learn how to fish for shrimp, Alain will take you. If you want to go hiking up the mountains for an incredible view of the lagoon, he’ll take you (and you’ll learn about all the plants on the way). Is canoe-ing and net fishing your deal? He’ll take you. How about doing stand-up on wooden rafts or discovering the waterfalls or discovering the countryside on a horse? Alain and his brother offer all of these visits at reasonable prices – and he is not only professional, but funny, personable and a fountain of knowledge. Does he do these visits in English? He assures me he’s been working on his English. If you speak a bit of French (even if only a little), my guess is you’ll be able to communicate and you will learn a lot from him (he has a pedagogical, hand-on approach, which accompanied by gestures, will make sudden sense in context – throwing a fishing net, climbing, doing stand-up, cleaning fish, etc.). So what’s this adventure I’m talking about? 2. Make a meal on a desert island. Many of you may be experts in the field, but fishing and cooking with nothing are not among my skills – well until now. We had a survival course of sorts during our one-day outing with Alain to Ilot Tibarama the next day. We met Alain at the dock at 7:45am with protective shoes, bathing suits, sun protection, snorkeling equipment and plenty of water. He provided all the rest (breakfast, lunch supplies, a few wooden bowls, chopsticks, a net, more snorkeling equipment, table, coffee, water, lemonade, matches, salt and pepper, a knife or two) and off we went to a sliver of an island (I like to think of it as “Gilligan’s Island”), 5-10 minutes away by boat. When we landed, we off-loaded the boat and said goodbye until 4pm that afternoon. Things stored away, off we went around the island in search of fish (which Alain taught us to look for, not on land or in water, but from the tops of trees). Parrot fish dine on coral and when eating in shallow waters, their beaks dip down and their blue tails stick out of the water – this is what we were looking for. We were also looking for schools of sardines. Unlucky at 8am, we collected coconuts and wood for later. Back at “camp”, Alain taught us to clean some fish he had brought, in case we were unable to catch any ourselves (we did later that day, but after lunch). They had been caught 2 days before on another outing. Cleaned fish, we chopped it up for Tahitian salad, which is a raw fish salad. Table installed in the water on the beach, we chopped and seeded cucumber, chopped a carrot, sliced half of an onion, squeezed a lemon, and checked and double-checked the fish for bones. Then, we learned how to make coconut milk. 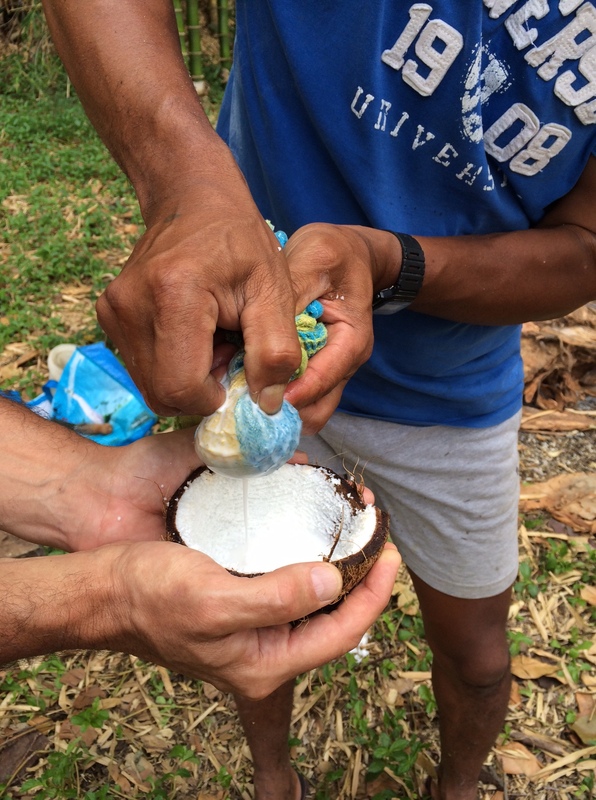 Alain cracked open the big coconut exterior (this is bigger than the coconut you are imagining – it is its exterior). You want the brown coconuts for this, not the green ones – and you’ll need to make sure that when you shake them, you can hear liquid sloshing about. Once he had the coconuts out, he cracked them in two with a machete – best to do with a very sharp knife or a hammer at home. This is the hardest part done. Then, we grated the coconut flesh into a bowl. Finally, we put the flesh into a tea towel and squeezed it over another bowl – out came the most delicious coconut milk you have ever tasted in your life! Who knew? Having “cooked” the fish in lemon juice, we now added the carrots, onion and cucumber, and added the coconut milk last of all. Et voila! Tahitian salad! We then set to grilling fish on the fire in papillottes (wrapped in aluminum), made with the wood and fronds we had gathered, and shortly, everything was ready. Tahitian salad, freshly grilled fish, another salad prepared by Alain, lemonade, water, and my, it was the most delicious meal made fresh we’d ever had. 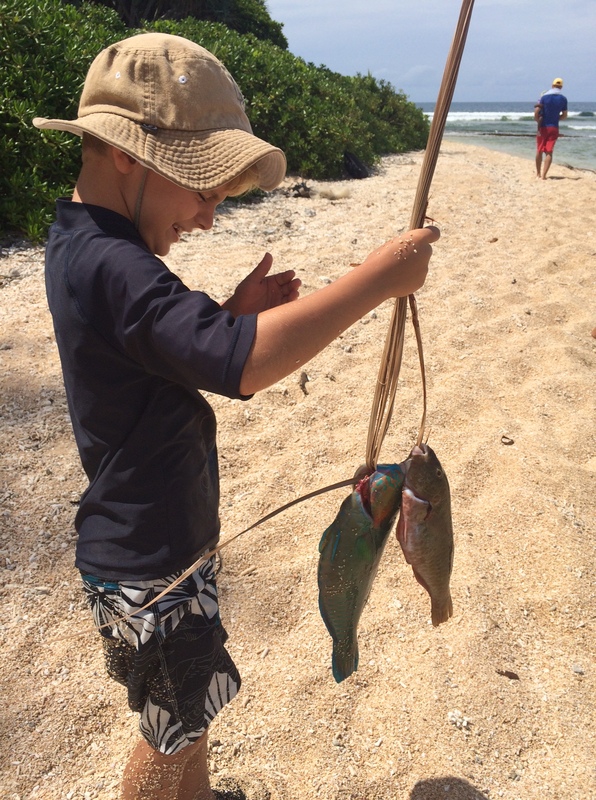 The afternoon saw more fishing adventures, and this time, we learned how to catch parrot fish with a net. 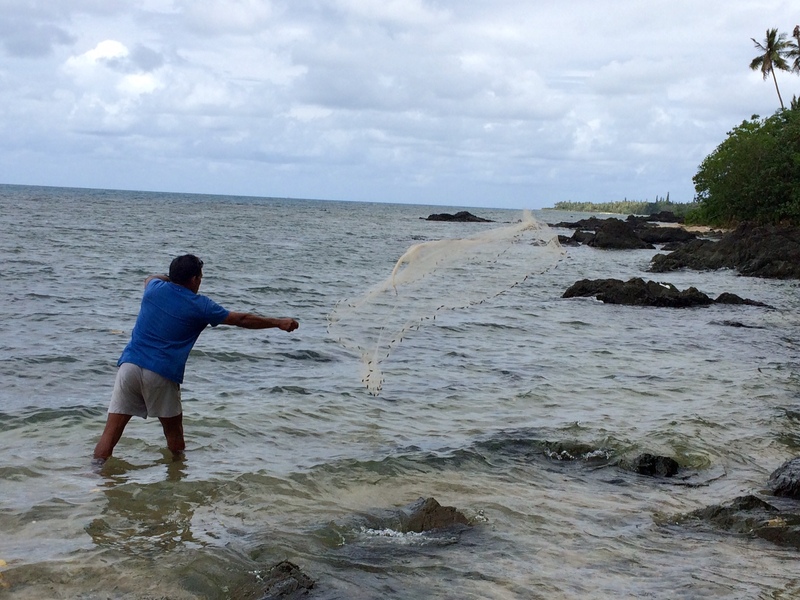 Having spotted schools of parrot fish, Alain went gingerly out into the water and placed a huge net around an area. When he gave the signal, my husband was to make a lot of noise splashing his hands in the water and shouting, to drive the fish into the nets. 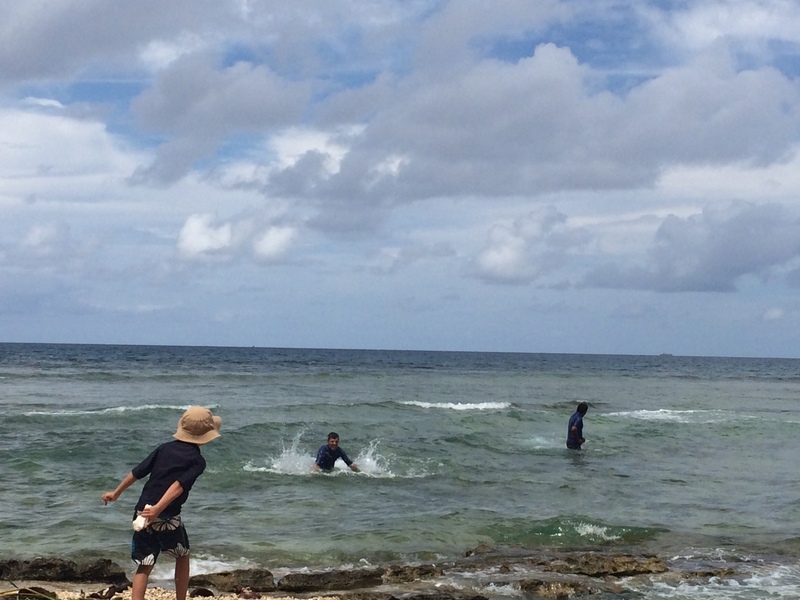 My son was to throw rocks to scare the fish into the direction of the nets, and I, wearing white, was to run up and down the beach waving my arms (apparently white – moving quickly – can be picked up by the fish and scares them as well). What a sight it was! A communal effort, and after several tries, we caught 4 fish and threw a 5th one back. We replenished the stocks and would feed another family. With time at the end, after coffee, for some snorkeling in pristine waters, the day was one of our best yet. Our little Robinson Crusoe experience had taught us some new skills, brought us together as a family, and made us a new friend. We learned even more about Kanak traditions and customs and walked away the wiser in body, mind and spirit! If this sounds like something you’d like to do – an all-day outing on a desert island, learning about life in New Caledonia and gaining some survival skills – or if any of the other activities mentioned above strike your fancy, do contact Alain at Brousse O’thentik (email: brousseothentik@hotmail.fr | mobile: 97 59 69). Tell him I sent you! Gégé was right. The wind kicked up last Thursday and by Saturday, at 25 knots, we’d only seen wind that strong on pre-cyclone days. Thank goodness the wind held, the sun shone, and the champions from all over the world got what they’d flown so far for. Amazing! Sunday (23 November) saw just an inkling less wind and the fans were out en masse for the spectacular finals (watch the video above to get a sense of the extraordinary sailing and excitement). Chatting with Sarah Quita-Offringa of Aruba, who placed 3rd in the race, she said this was the best spot for windsurfing she’d been to all year – just incredible sailing out there! The jubilation was all over her face. 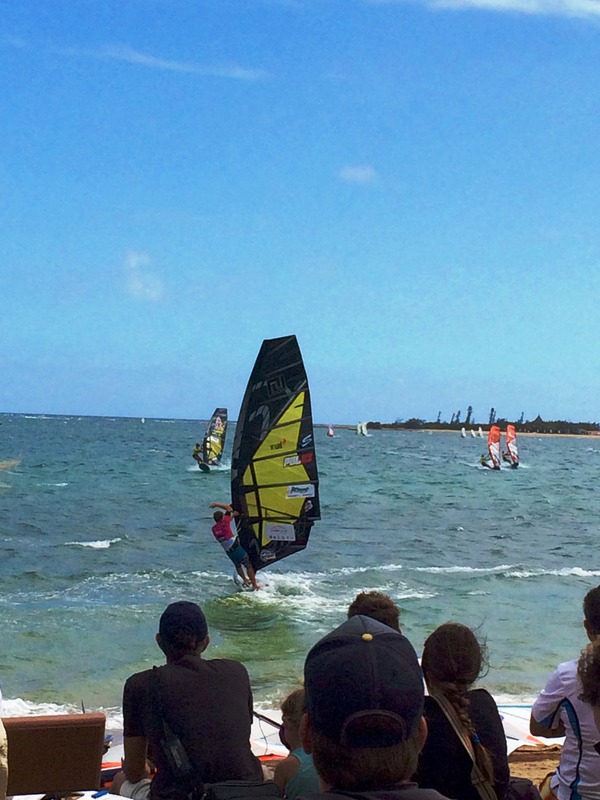 What a success for everyone – the competitors, the local windsurfers, the organisers, and the fans. Congratulations to all the competitors, including Matthieu Blavette, our son’s windsurfing trainer. You were all breathtaking to watch! I do so hope Nouméa will see this race again in its near future: it’s time to share this site and conditions once again with the world.